Last time around, we tried the largest (the 1050) and the smallest (the 1010 baby), both of which offered a lot of speaker for relatively little money. The same basic formula still holds with the new models, though on this occasion we're examining the £140 per pair 1020i, a worthwhile step up the 'size ladder' from the tiny 1010, but at seven litres still very much a miniature. Indeed, the 1010 is so small it's really only suited to surround sound duties, whereas the 1020i should work pretty well as a stereo speaker system, especially in smaller rooms and when close to a wall. These factors will help compensate for the limited bass supplied by the 90mm cones of the 125mm bass/mid drivers and 65hz-tuned twin front ports. The chunky-looking MDF enclosure, finished in cherry, beech or black vinyl woodprints, seems very tough and needs no extra bracing. The wrap edges are nicely post-formed, a 25mm soft dome tweeter is rear-mounted into the curved, silver painted front layer of an extra thick baffle and the signal is applied via twin terminal pairs. 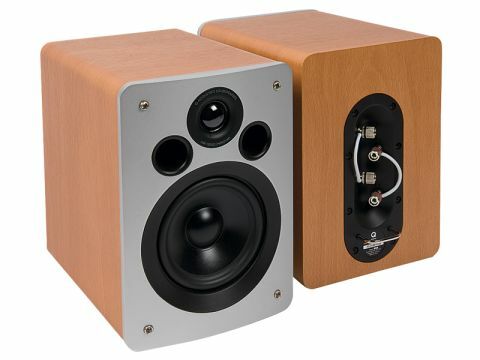 Such a small speaker can hardly be expected to offer much in the way of bass extension, but the compromises adopted here are very well judged, provided the user is happy to locate the speakers quite close to a wall. The treble is notably smooth and well judged, but there is a peaky tendency around 700hz -1khz. The impedance is around 4.5ohms across much of the band, with mild variations between the two samples. Sure you don't get much in the way of dynamic drive and there's no deep bass to speak of either. But those are amongst the rarer and more costly features and utterly improbable at £140 per pair. Accepting these constraints, the 1020i does nearly everything else impressively – nay, remarkably – well, delivering an overall sound quality that would do credit to a speaker two or three times the price.